My guide, who also happened to be a model, for the day was Michiko Aoki. She worked in the area as a mountain guide and the minute I arrived she asked me if I really wanted to climb that day despite the difficult conditions. She told me that the mountain was completely blanketed in white so I wouldn’t be able to see the view I was looking forward to and the snow conditions weren’t the greatest either. Michiko went on to explain that because the best powder snow is so light, it gets blown around the place when exposed to strong winds. Furthermore, the strong winds then cause the fine particles of snow to stick together creating dense conditions which make the snow feel heavy for skiers and snowboarders. I came to a sad realization after hearing this for the first time but, since I’d driven all the way there I decided to climb the mountain anyway. I barely saw a single Japanese person when I rode on the ropeway which could seat up to 101 people. Most of the visitors appeared to be from Australia, New Zealand and Europe. 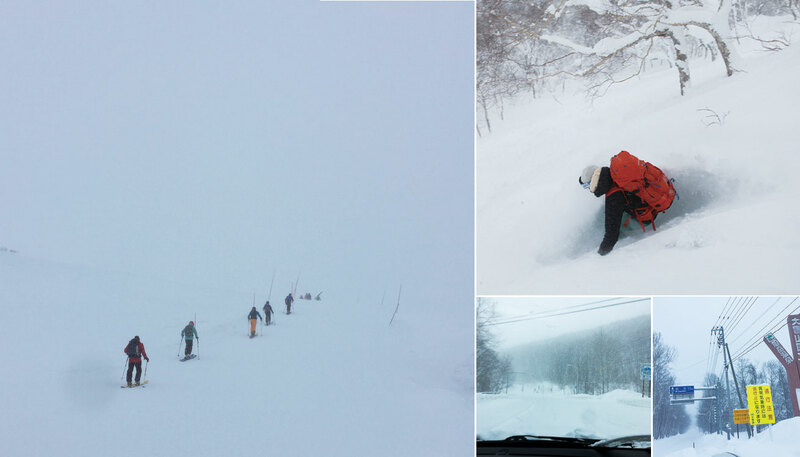 Upon arrival at the ropeway stop, there was practically no visibility in the direction of the summit. It was also extremely cold at minus 21 degrees Celsius. Though there were a small number of people hiking towards the peak, we decided against it. According to Michiko, there were plenty of areas to enjoy the powder snow which did not require a hike so I headed straight to the places she recommended to me. Though the winds were rather strong and the courses rather difficult, skiing through the fluffy powder snow felt fantastic. The snow had apparently gotten dense and heavy but, it didn’t bother me at all. I told Michiko my thoughts on the snow and she laughed suggesting that perhaps she had been spoiled by too much good snow. We spent the day riding up both ropeways and finished off our runs. If you were to ask me if I had a satisfying ski experience, then I wouldn’t be able to truthfully say that I did. It was numbingly cold, the wind was fierce and I wasn’t able to hike all the way to the peak so I could do was look forward to my next trip there. However, I was able to get a true feel for the potential of Mt. Asahidake. I told Michiko that I’d see her again someday and left the slopes.